RealAnime is an easy-to-use Graphical User Interface to convert DIVX files and other formats into smaller files using state-of-the-art technology. All you need is to drop your video files in, tweak the settings and start the encode. RealAnime will encode all your files in a row. 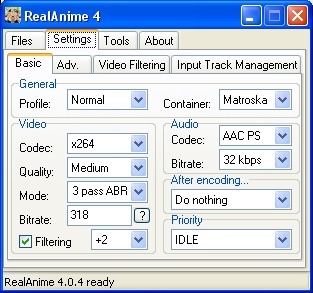 The main codecs are x264 and aacPlus v2, but RealAnime also supports XviD, RealVideo 10, AAC HE, AAC LC, Vorbis and MP3. It also supports multi-track inputs like OGM, MKV and MP4, letting you choose what to keep. RealAnime is Freeware and Open Source, licensed under GNU GPL v2.